We have planning permission to store a small number of caravans and all are under cover in barns. You do not have to be a member of the Caravan and Motorhome Club in order to store your caravan with us, but you must be a member if you want to stay here for a holiday. We are easily accessible from an ‘A’ Road, and within about an hour’s drive of Liverpool, Manchester, The Wirral, Cheshire, North Wales, Birmingham and other West Midlands areas. Caravans are not double-parked and are accessible to their owners at all times. It is up the the owner to move the caravan in and out of the storage bays (we will not do this for you). Storing your caravan with us does not guarantee you a pitch our site – you still have to book your pitch in the normal manner, and we are only allowed to have 5 caravans on the site at a time. Unoccupied caravans may not be left out on the Caravan Site – we do not have Summer seasonal pitches. 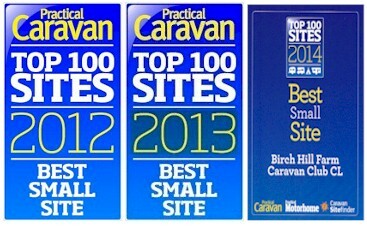 Our storage barns are very near the site, so not far for you to tow your caravan. (Note: a ‘seasonal pitch’ is one where you may leave the caravan out on the site all summer, and stay there from time-to-time: this is not allowed for Caravan and Motorhome Club CLs such as ours). Storage is for a minimum of 12 months, payable in advance. We do not have a Winter-only rate. Having said that, if we have a space in the barns, we may allow short term storage, such as a few days mid-holiday.